We required a purpose-designed trailer to house state-of-the-art well-site mineralogical analytical equipment (RoqSCAN™), and accessory equipment. The trailer needed to be mobile enough to be packed and moved between well sites quickly, while still being robust enough for long-term use at the well site. inTech was able to accommodate our short-term need by making required modifications to our existing stock. They then worked with us to design and manufacture ergonomic fit-for-purpose trailers for our mobile RoqSCAN™ units. The team at inTech was particularly effective in accommodating our short-term needs and timing in the refurbishment of existing stock to our specifications. They were then extremely helpful and skilled in designing the new trailer to accommodate many of our "wish-lift" items, including liaising with third party suppliers to accommodate very specific electrical requirements. inTech also continues to work in close partnership with us, providing us with their years of trailer manufacturing experience to help us further improve and refine new trailer designs. Trojan Safety Services has a division of Air Quality Monitoring units, we required a light weight durable work station to be mounted on a cab and chassis to accommodate analyzers, computers and work station and at the same time be able to handle the harsh environment in northwestern Canada. We contacted InTech regarding design they were already marketing and with the help of their engineering and sales staff we were able to redesign the existing floor plan to fit our direct needs and moved forward with the build. I found the entire staff at inTech very easy to deal with and they went out of their way to understand what we were looking for as an end result. They finished the project in a timely fashion and turned out a very good product. We have had the inTech truck in the field with no issues and presently are building a second unit. Absolute Control was in need of a quality trailer that was lighter, better manufactured and designed to accept the hydraulic power unit and controls that we installed into them. The trailers that we were using were poorly made and there was no consistency in the designs. When we approached Intech we described what we needed and what our issues were with our previous supplier, in short order we had a proposed design that exceeded our expectation. Even after delivery of our first units Intech worked with our in house engineering and design group and refined the trailer even more to eliminate hours of prep and assembly time in our shop. The team at Intech Trailers makes the best trailers I have been able to find. From the moment we met them, to delivery of our trailers, they have gone above and beyond to help design a custom trailer that fits our needs exactly. The quality and design of Intech's trailers have given us an edge over our competitors and also helped us gain a reputation for supplying one of the lightest and most user friendly control units on the market. We look forward to many more years of business between our companies. 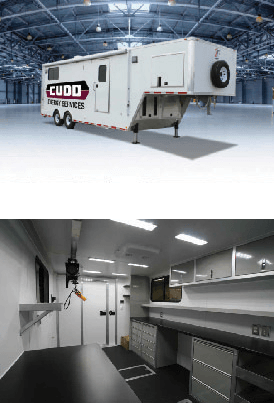 A support trailer on location in the well servicing industry, to use in conjunction with an E-Line Coiled Tubing Unit, complete with an office to serve as a control center, a workshop for completing immediate, on-site tool repairs, and storage space both throughout the inside and the length of the trailer under the floor. Worked with customer input and requirements to provide a custom 32’ gooseneck, bunk trailer with a 12KW Diesel Generator, 250psi Air Compressor and storage space in the divided, bunk; independently climate controlled office space equipped with a quad-rack frame for the installation of the proprietary control center, collapsing desktop, bench seat with additional storage, light table, refrigerator, curb-side door, and cabinets and drawers; separated independently climate controlled workshop with bench tops, storage cabinets, shelves and drawers, overhead sliding hoist, closet area, and a back door-within-a-door; underneath storage with rollers and tie-down anchors accessible by removable panels throughout the trailer floor. A lot of thought went into the requirements and design to fulfill our need for a support trailer. InTech Trailers worked with us in customizing a truly unique trailer to meet our needs in the well servicing industry. The result is the ability to run downhole tools from the professional office space and complete tool maintenance and repair in remote locations. The trailer is a real head turner traveling on the highway between jobs and on location.